The Death Penalty in Texas: A Change of Heart? Something is afoot in America’s most “law-and-order” state. The number of people sent to death row is declining. On Sept. 21, 2006, Juan Quintero, an undocumented Mexican national, was arrested after a routine traffic stop in Houston. The arresting officer, Rodney Johnson, frisked and cuffed Quintero, who was driving without a license, before placing him in the back seat of his patrol car. But Johnson missed the gun that Quintero had hidden on him. Moments later, as Johnson sat in the front seat writing up a report, Quintero fired seven times, killing the officer. Johnson’s murder shocked Houston. But what happened afterwards may have been just as startling. Juries in Harris County (where Houston is located) were once notable for handing down death sentences. 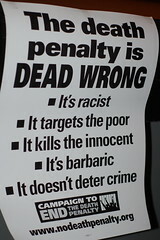 They stood out even in Texas, long a pro-death penalty state. During the 1990s the county sent more than a dozen convicted felons a year to death row—a larger number than some states—and currently accounts for more than a third of the inmates on Texas’ death row (106 of 332). Nevertheless, Quintero received a life sentence following his trial in May 2008. Even his gruesome attack on a police officer did not alter the change of heart that has apparently transformed Houston from what anti-capital punishment advocates once dubbed the “capital of capital punishment” into a death-penalty-free zone. Statistics bear that out. Last year, the number of new death sentences handed down in Texas dropped to nine, the lowest number since the state revived the death penalty in 1976, and down from nearly 30 in 2003. That’s a remarkable contrast to the peak years in the late 1990s, when as many as 48 people a year would be sent to death row, according to the TCADP’s annual report on the state of Texas’ death penalty. via The Crime Report » Archive » The Death Penalty in Texas: A Change of Heart?.